The android Phantomas has been entrusted with the dreadful task of killing Dracula. To accomplish such a mission he has to make his way into Dracula's castle, open five locks, six windows, collect a hammer and a peg and finally get to the upper part of the castle to face Dracula. 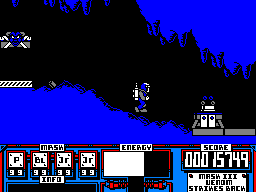 This game (originally released by Dinamic as Phantomas 2) has no music and the graphics are almost the same as you'd see on the Spectrum version. However, after a short period of training, you'll discover a very playable game with lots of rooms to explore. This is one of the few games I couldn't quit playing until I finished it. You have finally found Dracula's secret lair – an old tower block with working lifts! The Prince of Darkness is resting on the 12th floor and there's only a few minutes left until midnight. Can you make it to the top floor in time and deal with this spectre of evil? To succeed in your mission you will have to collect certain items that the vampire is afraid of. These are found in certain rooms, but be careful, for some rooms are filled with monsters. Such encounters drain your shock meter; if this runs dry you'll flee the building and fail in your quest. Some of the lifts are hazardous, which can result in your descent to a lower level. Vampire Killer is written entirely in BASIC and it shows, with sluggish movement, drab graphics and simple audio. If you do reach the Count, I doubt you'll come back for more. Vector ball is a futuristic sport where two robots – one yellow, one red – try to shoot a puck into their opponent's goal. The robots can't actually push the puck around the arena; instead, they have to swivel around and face the direction that they wish to shoot the puck. As far the concept goes, it's about as simple as you can get; it's the implementation that is poor. The controls are infuriatingly difficult to get the hang of, while the computer-controlled robot always snatches the puck from you and scores lots of goals. The isometric graphics aren't impressive, although the tune is good. You have been transported to an alien spaceship orbiting Earth, and the aliens have given you the task of breaking into its on-board computer called Solomon. You don't know why they want you to do this, but you will be well rewarded if you succeed... Behind this very surreal background story is a brilliant arcade game that pays homage to the Vectrex games console, which can only display vector graphics. You control a small craft and must manoeuvre it through eight mazes of increasing difficulty, avoiding obstacles and collecting batteries to replenish your constantly diminishing energy. 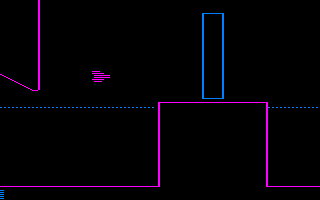 The graphics are drawn entirely using lines instead of sprites, and the game moves incredibly fast as a result. It's also infuriatingly difficult, yet very addictive, and it has that elusive 'one more go' factor; once you start playing it, you'll be hooked! You used to be a high-ranking officer in the US army, but you have now been thrown out, and your brother and niece have been kidnapped by terrorists who were once in the army. Your mission is to rescue your relatives and collect evidence along the way. On each level, you must explore all the rooms and search every nook and cranny for clues. 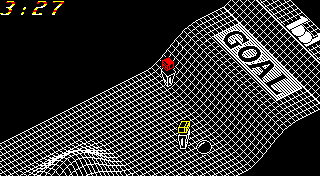 Unfortunately, this is an extremely frustrating exercise, as you have to be in exactly the right position to find objects. Ultimately you spend ages just moving randomly and relying on luck to get the object you want. The graphics are in boring monochrome and there's hardly any sound as well. The land of Armosin is overshadowed with evil, and Traklan and his Venomite priests stalk the land and bring terror to it. Arrell has been captured, and your objective is to rescue him. This adventure is different from most others in that instead of typing in commands, you select them from a list using the cursor keys or joystick. This takes time, since the cursor moves really slowly, but if you stick with it, it is a nice enough adventure (albeit rather small) with some decent pictures used in a few locations. Matt Tracker's son has been kidnapped by VENOM and taken to their moonbase. In this, the final game in the MASK series, you play Matt, who is on a rescue mission to free his son. The game itself is very similar to Exolon where you run and jump from left to right blasting anything that moves. Power-ups come in the form of helmets that give you additional abilities such as levitation, ghost mode and better powered weapons. Bizarrely, they all look like squares with letters written on them. The gameplay is a little repetitive in places and it's a shame that the well animated visuals lack the vibrant colours of the previous games. Overall, VENOM Strikes Back is an average game and for me is the weakest of the three games in the MASK series. See also: MASK, MASK II. Vera Cruz, a pretty young woman, has killed herself. As a police inspector, you inspect her flat and find several clues that make you think it's a crime rather than a suicide. 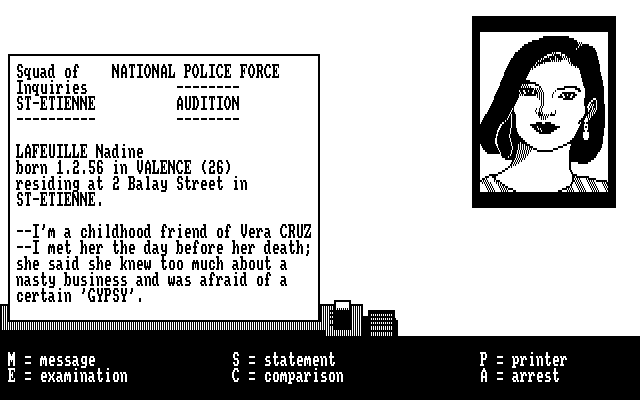 This is one of the first murder mysteries on computer. The plot and the whole investigation are very realistic (the programmer himself was a policeman!). The first part takes place in Vera's living room. You must collect clues (e.g. cigarette ends, a gun and a matchbook) that will be decisive in finding the murderer. The second part is in your office, where you can hear witnesses, contact other police officers or examine evidence. The few graphics are really good and though it's hard to progress, this is a great game for those who like to investigate. 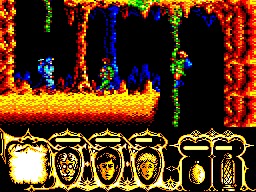 In this three stage game you take a journey to the centre of the Earth. The first stage consists of a puzzle and the third one is a side scrolling arcade game in which you make your way through a prehistoric jungle. The second stage is a game in itself. You take control of three characters at the same time, each with different attributes and objects, in their way down the inside of a volcano. Forget about the first level; go straight to the second level, and enjoy great graphics and gameplay right from the start. It's hard to believe that Victory Road is the sequel to Ikari Warriors, but unfortunately it is a poor coin-op conversion. You're a warrior on a mission. Armed with grenades and a rifle, you can tackle the foes along the road to victory by yourself or with a friend. With six lives you should be able to progress quite well, but beware, as not only will you encounter a competing military, but also monsters, which is really strange. The road winds on and on, through tombs containing the bones of former seekers. Collect icons to build up the firepower necessary to fight off your aggressors. The graphics are overhead like Ikari Warriors and there's limited sound. It really is an uninspiring and boring game. You'll have more fun playing its predecessor.